Having spent the night in Tacna, Peru, the next day had me cycling through the desert for the first time. I only had 60kms to ride to cross the border into Chile where I was to stay in a seaside town. 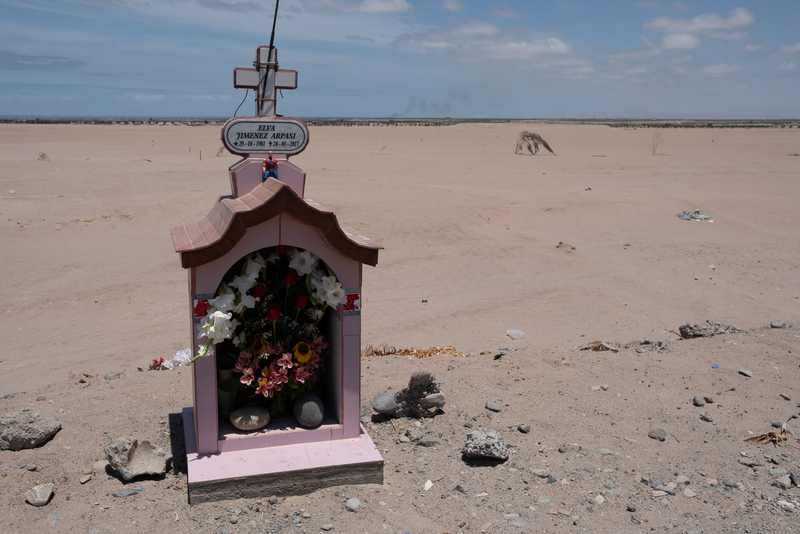 The desert already felt endless, (it actually stretches over 1000 kms) and the only things of interest on this stretch were the relatively frequent roadside memorials. They vary from simple crosses to more elaborate affairs, and seem to be a common feature around here. Not sure whether you just notice them more in the desert, but there did seem to be a lot of them. The border was ok, albeit there was a lot of paperwork re the bike. My bicycle is now registered with the Chilean authorities as a ‘vehiculo’. No-one was really sure what to do, and they gave the impression they were making it up as they went along. Which was odd, given that I can’t be the first person to cross the border on a bicycle. But then again, the sign at the approach didn’t have an option for ‘bicicletas’, so maybe I’d just taken the wrong lane?! I took a route that first took me along the coast, so I cycled a few hundred kilometers with the Pacific coast on my right, and the mountains leading up to the desert on my left. Whilst the view was dramatic, it didn’t change much. The towns and villages were absolutely deserted. Some of them looked desperately poor, which was a surprise given that, of the countries I’ve visited so far, Chile was already clearly the most expensive. On one stretch I rode with a local cyclist, who told me that this beautiful memorial was to a young cyclist who was killed by a trucker using his phone. Whilst I do have a mirror, and watch out for big vehicles that look like they might pass too close, it was a reminder of the danger. There were significant stretches with neither hotels, nor shops, nor restaurants, so supplies had to be carried and the tent used. This particular spot was by a permanent vehicle check (looking for prohibited transport of fruits and plants). Whilst the surroundings were grim, it was at least shelter from the battering wind that rose up in the afternoons and evenings. 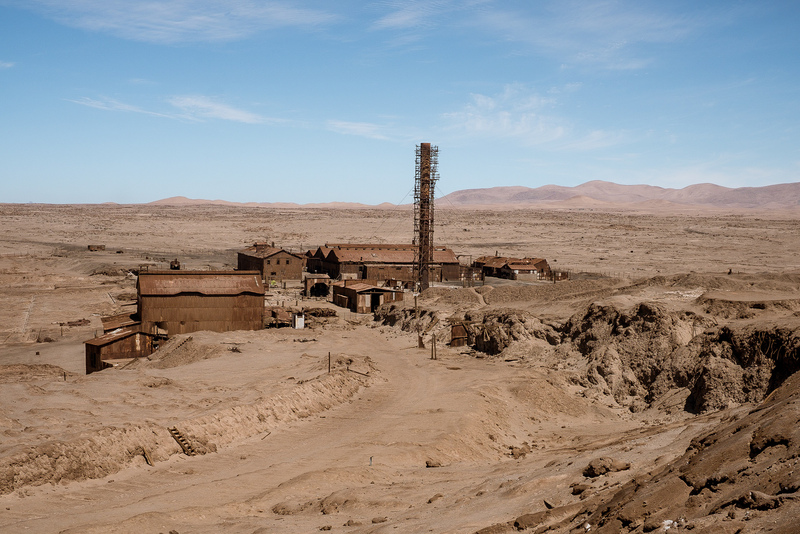 An interesting site (that I visited from the town of Iquique, whilst I was staying there for a couple of days) was a place called Humberstone This ghost town was a former site for extraction and processing of ‘Saltpeter’ (potassium nitrate) which was sold throughout the world as fertiliser. 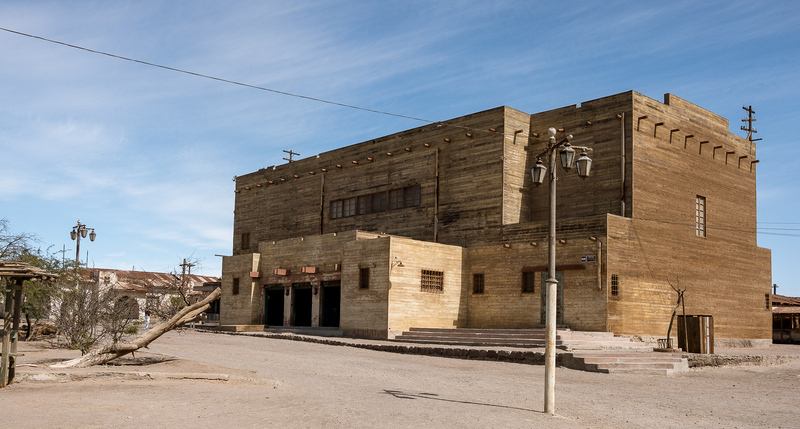 Because of the location deep in the desert, it had to be a self-sufficient town, complete with schools, theatre, shops and recreational facilities. The decline of the industry began in the 1930’s, when artificial fertilisers began being produced, and by the 1960’s the site was abandoned. 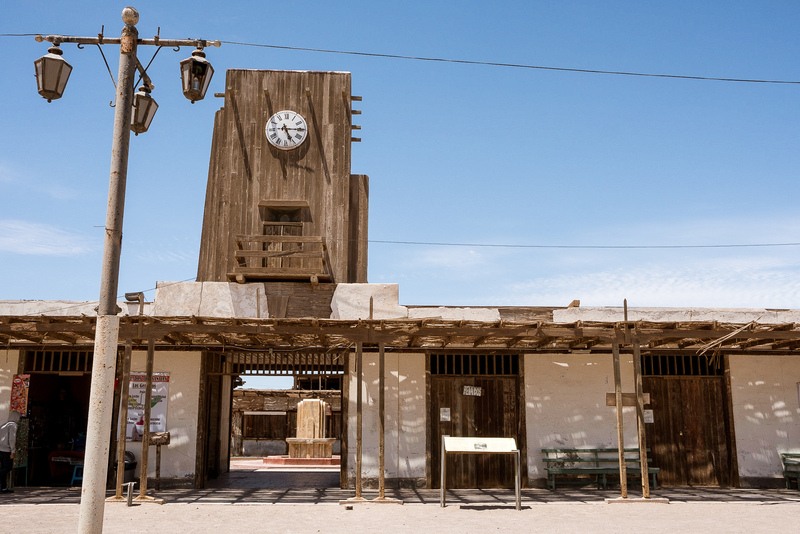 What remains is an incredibly well preserved town (due to the absence of rain), in the searing heat of the desert. It is now a UNESCO world heritage site. 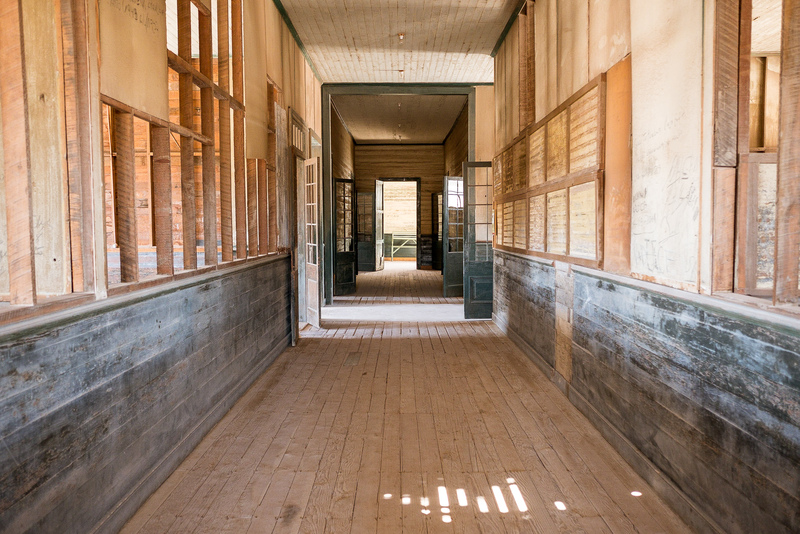 It was fascinating – and slightly eerie – to walk around. 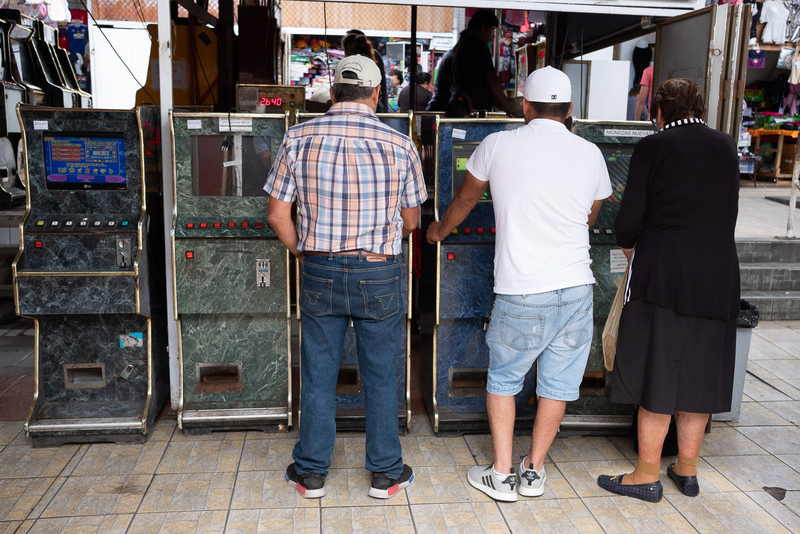 In Iquique I loved the big market, where I spotted these very old-school arcade machines, and found Grandma taking a cheeky flutter. 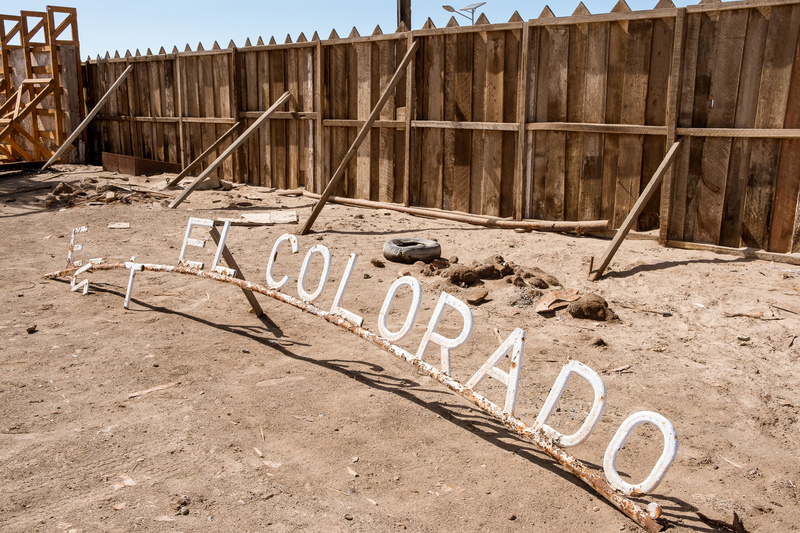 From these first days in Chile, it was clear that the desert was going to prove a challenge, particularly in terms of carrying enough provisions. 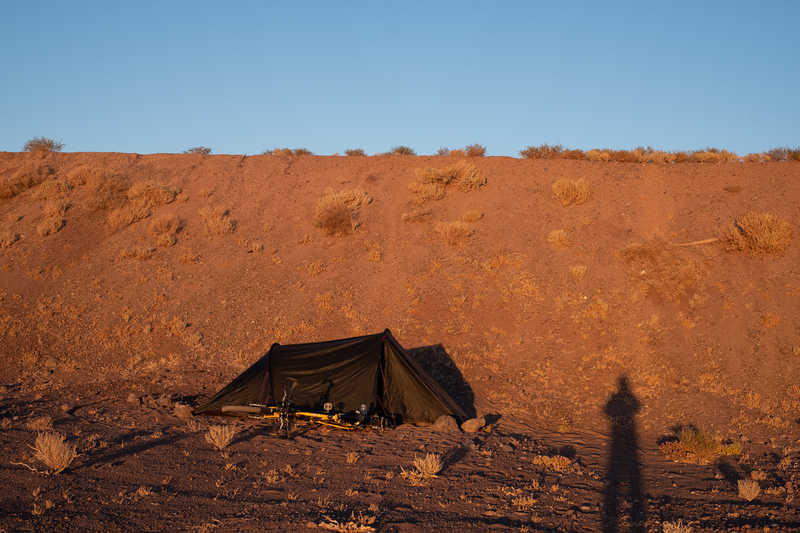 Whilst I love solo touring, the disadvantage against cycling with someone is that you can’t share the weight of things such as tent, cooking equipment, tools, camera, etc. So if you start having to load up with 15 litres extra of water, and several days food, it becomes much less enjoyable. For this reason there were three stretches in Chile where I chose to take a lift, twice by bus and once by car. This allowed me to enter the desert without worry, knowing that I didn’t ever need to take more than 3 days of supplies. 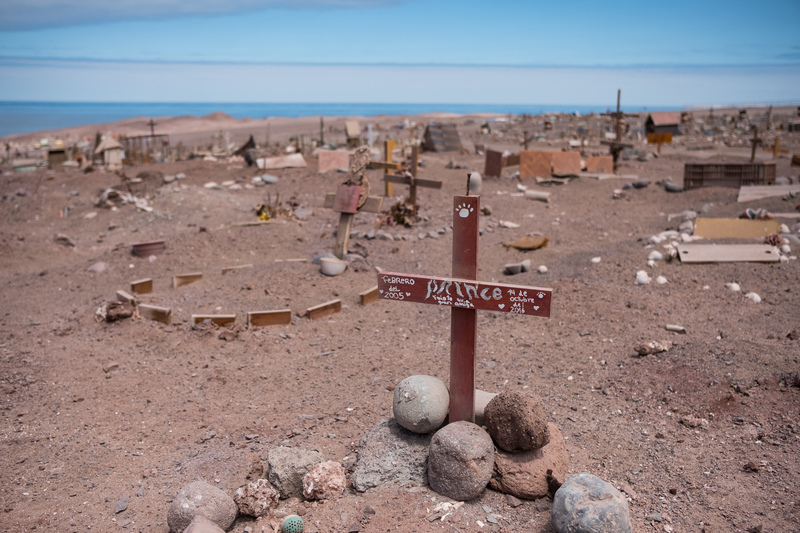 The Atacama is one of the driest places on earth, with some weather stations never having recorded rain. The area where I started has an average rainfall of about 2mm per year. One part where I took the bus was in order to rise from sea level up to 3000 metres. Whilst the gradient would have been ok normally, doing it in the heat of the desert with the extra water would have been ridiculous. 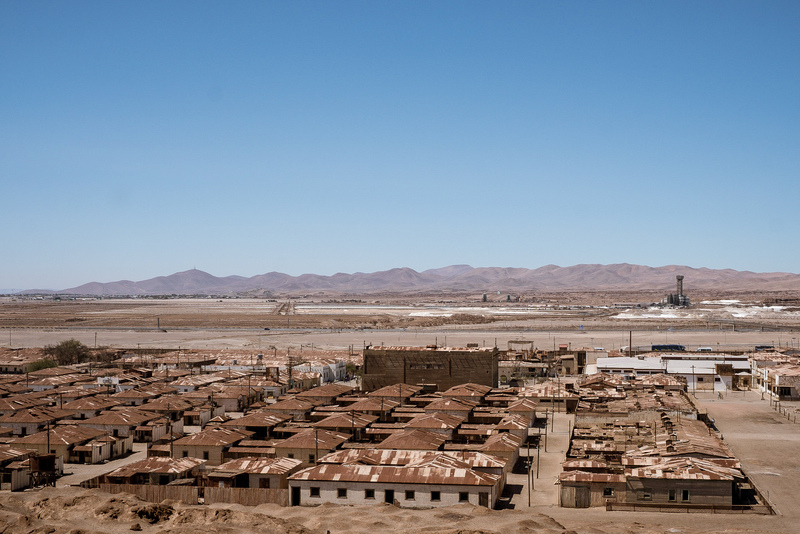 Taking the bus meant I still had a two day ride to San Pedro de Atacama, a bit of a tourist trap in the desert. That still left a 1000m climb over 60kms in intense sun. I was glad of the T-shirt and arm protectors I’d bought with built in UV protection. 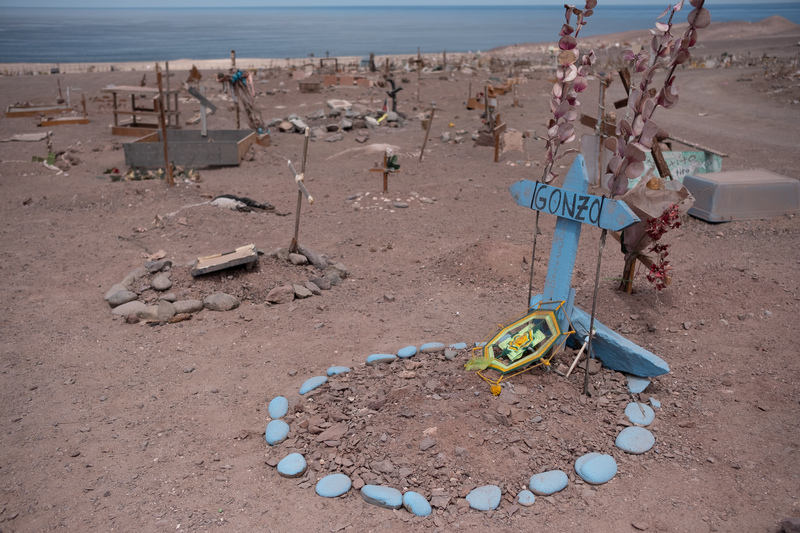 In the whole of the 60kms, the only place with any shade was another roadside memorial. I’m sure the family wouldn’t have minded the fact that I used it to enjoy my peanut butter lunch. My overnight camp was sheltered by the side of the road, but nicely out of sight. The night sky was simply stunning (I’m not carrying a tripod, so unfortunately no pics). The sunrise was also beautiful, and a perfect way to start the day. 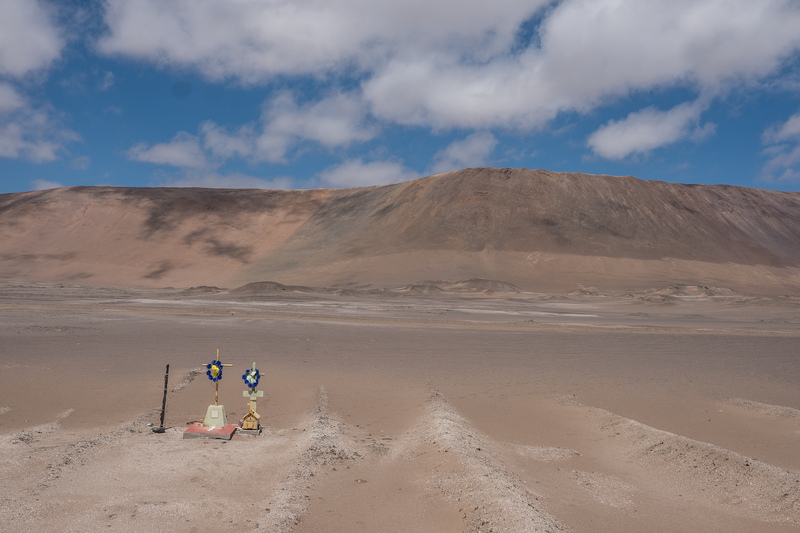 San Pedro de Atacama itself was a weird place, albeit with a beautiful road leading up to it. 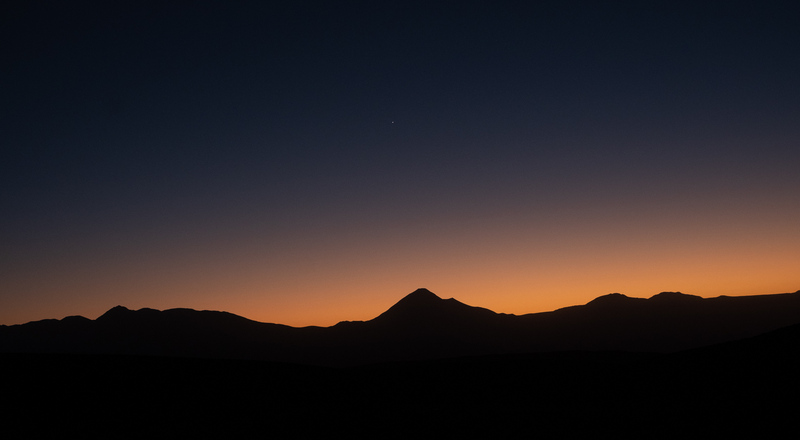 It’s isolated in the desert, but full of tourists taking adventure tours to various beauty spots in the Atacama. I was happy to leave, using a local cab to get me to within 50 kms of the border with Argentina. According to the map, there were no places where I could get supplies on the way, and locals confirmed this. It transpired that there were a few places, and I’d have been fine, so it was a shame to miss much of the ride. 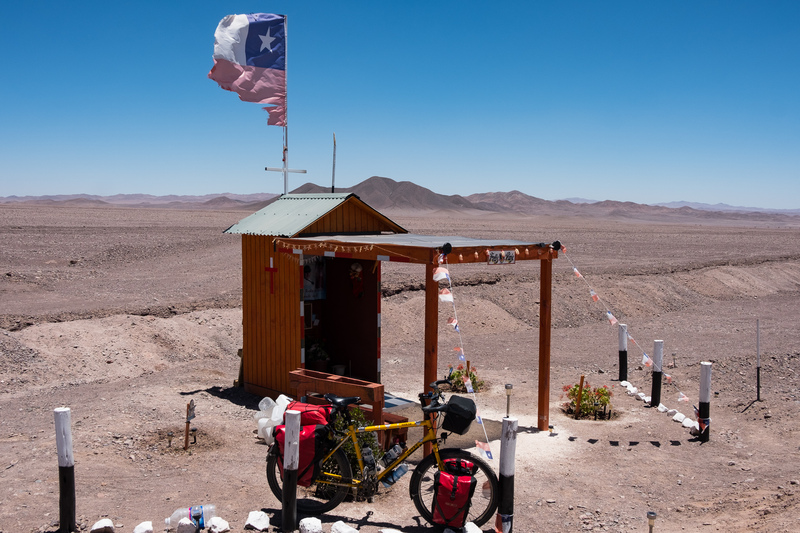 The stretch I did cycle of the ‘Sico pass’ to the border with Chile was simply stunning, and I enjoyed every kilometre. Once at the border, it was obvious that not many people used this route. I asked how many, on average, per day? The answer was ‘between 10 and 20 people’. The next sentence surprised me though, and at first I wasn’t sure I’d heard right. I was asked if I wanted to use their hostel. 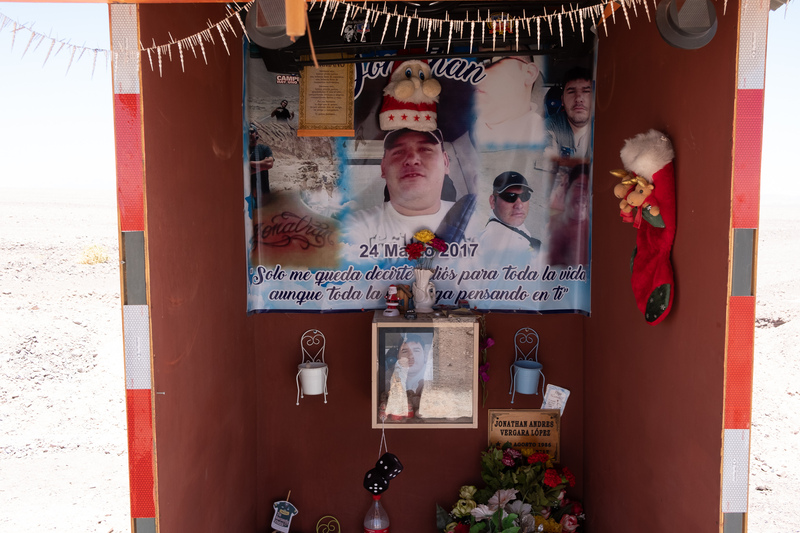 It turns out that when they built the border facility, they thought they’d add some rooms for cyclists, as they knew there was nothing else around. And it turns out the very comfortable accomodation was entirely free of charge for ‘viajeros’, or travellers. What a welcome to Argentina! 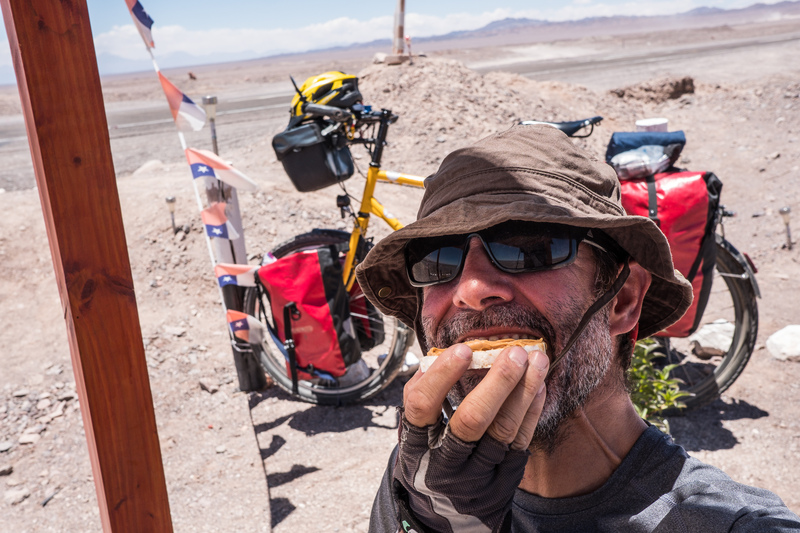 I was also pleased when not long after I was joined by Stephano and Tracey, an Australian couple also cycling round South America. We had a great evening swapping tips and stories. The next day it was time for a quick picture and a goodbye to our new friend from the Argentinian police, and we cycled off to new adventures in another new country. Stunning photos as ever. I did wonder how you got that amazing one of you cycling down the road, ocean to the right, mountains to the left, and then you mentioned you met up with a local cyclist. I assume he or she was the answer to that puzzle?! Will you be revisiting Chile, perhaps visiting Santiago to see John and Gertje? Excellent photos! Once again, your adventure is truly fascinating and as I sit in the cold of Chicago on this U.S. holiday (Thanksgiving), I am truly envious of the warm sunny climate you are enjoying! Stay safe. Goodness me….I thought you might have given up and returned home by now! This last phase of your journey looks particularly desolate ( although beautiful). Do you get very lonely when you are so alone? Whats next after Argentina? will you be home for Xmas? Thanks for the fascinating, down to earth trip…..My spirit is with you….! 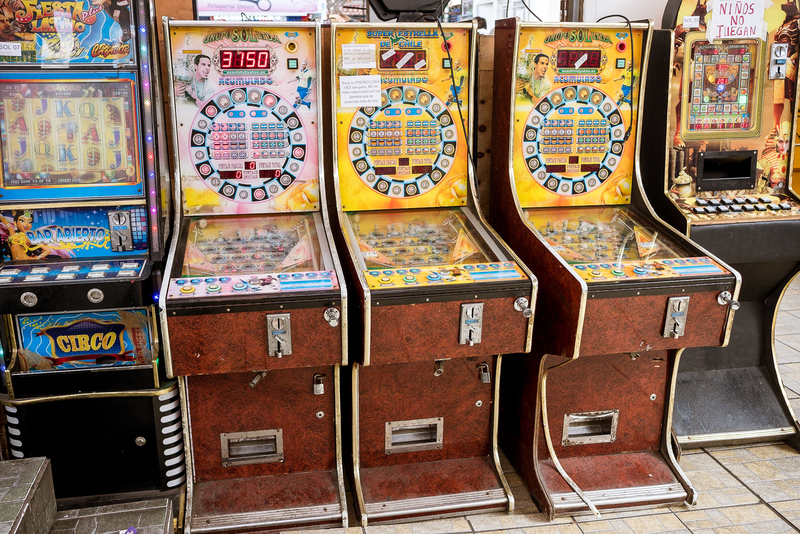 Hope you are having a ball. looking forward to your next instalment very much! Safe pedalling! What an amazing ride – first this beautiful trip alongside the Pacific coast and then just stones sand an sun. 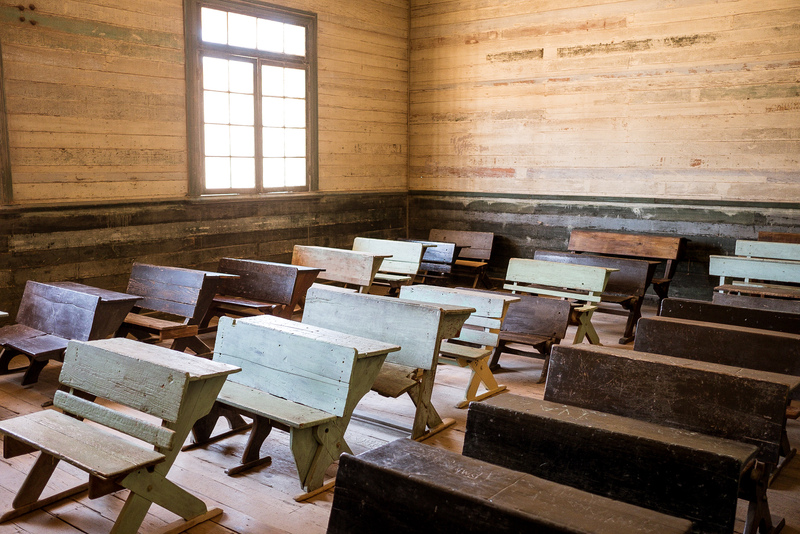 Having just been to London for a week to visit our “old home” it´s a relief to see the beauty of solitude with no one arguing on “leave” odr “remain”. Wherever you will be spending the coming days and weeks we would like to wish you a peaceful and relaxing timeChristams time and all the very best for the New Year.